On this date in 1057, Mac Bethad mac Findlaích (anglicised as Macbeth, and nicknamed Rí Deircc, “the Red King”), died in battle (the same day he killed Duncan I in battle in 1040 to become king). Macbeth was King of the Scots from 1040 until his death. He is best known as the subject of William Shakespeare’s tragedy Macbeth and the many works it has inspired, although the play presents a highly inaccurate picture of his reign and personality. Let me try to set the record straight. Some of what follows is disputed by historians because contemporary (or near contemporary) sources are biased and conflicting. At the very least it is much closer to the truth than Shakespeare’s play. 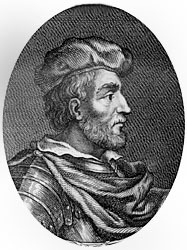 Macbeth was the son of Findláech mac Ruaidrí, mormaer of Moray. His mother, who is not mentioned in contemporary sources, is sometimes supposed to have been Donada, a daughter of the Scottish king Malcolm II (Máel Coluim mac Cináeda). At the age of 7, Macbeth was sent to a Christian monastery to be educated by monks—a requirement for all chieftains’ sons. At age 15, Macbeth’s cousins, Malcolm and Gillecomgain, killed his father, possibly for being too close to Malcolm II, and potentially limiting their own royal aspirations. Macbeth reappears in annals around 1032 when his cousin, Gillecomgain, was killed by order of Malcolm II for his killing of Macbeth’s father. Macbeth was then elected mormaer of Moray, married Gillecomgain’s widow, Gruoch, and adopted her son, Lulach. The marriage strengthened his claim to the throne. On November 24, 1034, Malcolm II died of natural causes (not very common for Scottish kings!). One month later, his son, Duncan MacCrinan, was elected king. For six uneasy years, Duncan ruled Scotland with a thirst for power that was undermined by his incompetence on the battlefield. In 1038, Ealdred, earl of Northumbria, attacked southern Scotland, but the effort was repelled and Duncan’s chiefs encouraged him to lead a counterattack. Duncan also wanted to invade the Orkneys Islands to the north. Over the objections of all of his advisers, he chose to do both at the same time. The attack on the Orkneys was led by his nephew, Moddan, while Duncan led a force toward Northumbria. Both armies were soon routed and pursued by Thorfinn, mormaer of Orkney. Macbeth joined Thorfinn and, together, they were victorious, killing Moddan. On August 15, 1040, Macbeth defeated Duncan’s army, killing him in the process. Later that month, Macbeth led his forces to Scone, the Scottish capital, and, at age 35, he was crowned king of Scotland. So, although Macbeth did kill Duncan, as per Shakespeare, it was not an act of treachery. Neither was Duncan an old man at the time. He was described in the annals as young and vigorous. For 17 years, life was peaceful and prosperous under Macbeth. He ruled with an even hand and encouraged the spread of Christianity. He enacted several good laws, among them one that enforced the Celtic tradition requiring officers of the court to defend women and orphans anywhere in the kingdom. Another allowed daughters the same rights of inheritance as sons. The only domestic disruption was in 1045, a rebellion by Duncan I’s supporters that was soon suppressed. In 1050, Macbeth and his wife traveled to Rome for a papal jubilee, giving alms to the poor and donating to the Church. However, upon his return, Macbeth faced political turmoil brewing outside his realm. In 1052, Normans living in England fled the strife between Godwin, Earl of Wessex and Edward the Confessor into Scotland. Celtic custom held that all travelers were welcome in Macbeth’s court. However, this act of kindness did not sit well with the English nobility. Around the same time, Duncan’s 21-year-old son, Malcolm, was lobbying English lords, claiming that it would be in their interests if he were king of Scotland. In time, Malcolm’s efforts led to action. In 1054, Siward, earl of Northumbria, accompanied by Malcolm, led an army north into Scotland. Meeting little resistance from the southern provinces, they continued north. On July 27, 1054, Macbeth’s forces met the invaders in Dunsinnan, close to the capital in Scone. By the end of the battle annals report that 3,000 of Macbeth’s forces had fallen (3,000 being a round number in the annals meaning “a lot”). The invaders only lost 1,500 (that is, “many, but fewer”), and the outcome was indecisive. 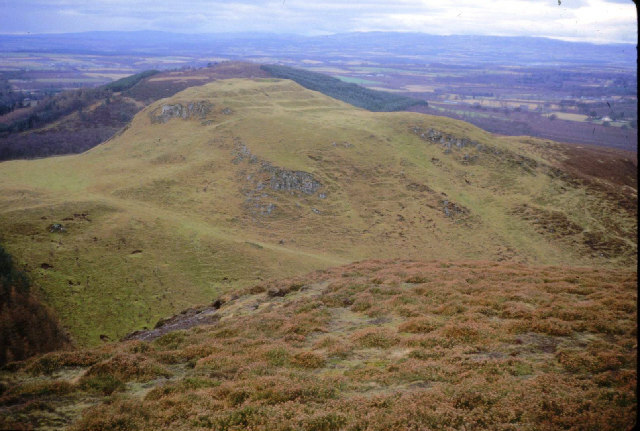 Macbeth retrenched his army near Scone, and Malcolm moved south to control Cumbria, the southernmost province of Scotland. Note that this is Shakespeare’s battle at Dunsinane, but without the leafy camouflage and without the death of Macbeth. It was a setback for Macbeth, not a disaster. Over the next three years, Macbeth and his army were under constant assault by Malcolm, but he was able to stave him off. In 1057, Macbeth lost the support of two key allies, Pope Leo IX and the bishop of St. Andrew, Maelduin MacGille-Ordain, both of whom could have put pressure on England not to support Malcolm. Macbeth also lost his chief general, Thorfinn, ruler of the Orkneys, who had recently died. On August 15, 1057, Macbeth was killed at the Battle of Lumphanan in Aberdeenshire by Malcolm’s men as he tried to return to Moray. Macbeth’s body was buried in the holy isle of Iona, where many other Scottish kings were buried. A few days after his death, his stepson, Lulach, was elected high king. Lulach ruled for seven months before being killed by Malcolm’s agents. 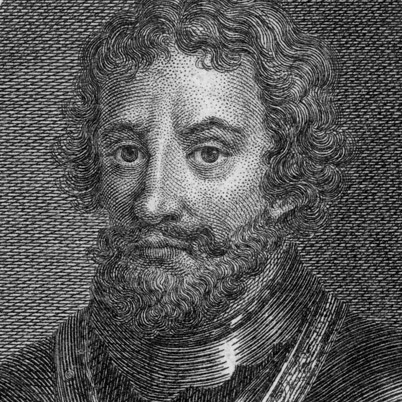 Finally, on April 25, 1058, Malcolm MacDuncan became high king of Scotland. Shakespeare used the 2nd edition of Holinshed’s Chronicles (1587) for inspiration, but, even so, much of the plot and character portrayal in Macbeth is his own invention, not to mention the fact that Holinshed is grossly inaccurate. Holinshed mentions creatures of the woods as Macbeth’s otherworldly visitors – youthful nymphs or fairies with a benign nature – but Shakespeare converts them to old, ugly, and malevolent hags. Holinshed says nothing of Macbeth’s personal nature, so the villainous, gullible, overreaching, tragic hero is also Shakespeare’s invention. The character of Lady Macbeth (one of the great stage roles of all time) is also a complete fabrication. About all we can do now is keep historical reality and Shakespearean storytelling at arm’s length from one another. Probably just as well to do the same for Hamlet, Julius Caesar, Richard III, and all the rest of his plays based on historical figures. Scottish cooking gets much the same undeserved bad rap as English cooking does from people who don’t know what they are talking about. I would defy anyone to taste an Arbroath smokie or Scottish smoked salmon or Lanark blue cheese and not declare them exquisite. You are allowed to be indifferent to haggis, although I love it, but Scotch Broth is superb and is not open for discussion. I tire of defending a cuisine that needs no defense. Criticism is based solely on ignorance. 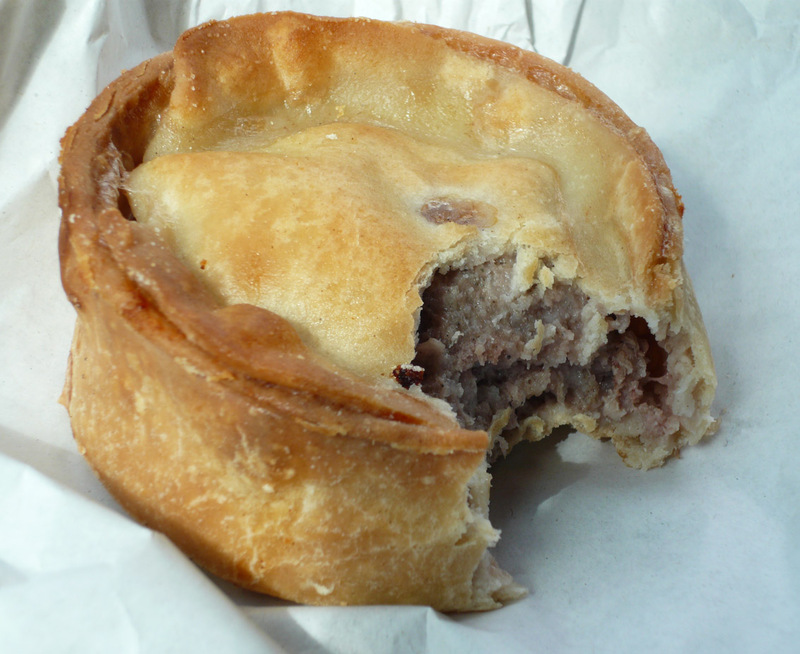 Here is a recipe for Scotch Pie, a common pub or lunch snack in Scotland as well as in England. Traditionally these pies are made with mutton, but lamb works just as well. They are made with hot water pastry which is very versatile for pies. It makes a solid (yet flaky) crust that can be baked without a tin (although you can get them), and that allows you to pick up the pie and eat it without it falling apart. Unlike other hot water pastry pies, such as pork pie, or veal, ham, and egg pie, this one should be eaten hot. They are usually made with the lid sunken slightly so as to hold gravy if eaten on a plate. Combine the meat filling ingredients in a mixing bowl and set aside, covered. Sift the flour and salt into a warm bowl. Make a well in the center of the flour. Melt the lard in a scant measure of the water in a small pan, and when it is bubbling add the hot liquid to the flour, working quickly to mix thoroughly. Keep the bowl and pastry warm otherwise you will not be able to work it. I usually put it on the hob over the stove. You are going to make 8 pies and lids, so you will have to gauge how much pastry you will need for each pie. Take enough dough for one pie and make it into a flattened ball. Grease the base of an inverted glass or glass jar 3-3½ inches (7.5-8.5cm) in diameter, and, working quickly, shape a pie shell over the base and down the sides. If the pastry cracks, pinch the crack together. You can trim the top of the pie shell with a knife to even it up. When the pastry has cooled (which will be quite quick). Remove the glass and place the pie shell, right side up on a greased baking tray. Repeat until you have 8 shells. Fill the shells with meat and gravy, divided evenly into 8. There should be a space between the top of the filling and the top of the shell. Roll out the remaining pastry and cut lids for the pies using the mouth of the glass. Wet the edges of the lids, place them over the meat and press down lightly so that the lid rests on the top of the filling. Pinch the edges of the lid with the top of the shell so that it is completely sealed. Poke a small hole through the center of the lid. Brush the surfaces of the pies with milk and bake for about 45 minutes. The pies should be eaten straight from the oven, but can also be stored in the refrigerator for several days.